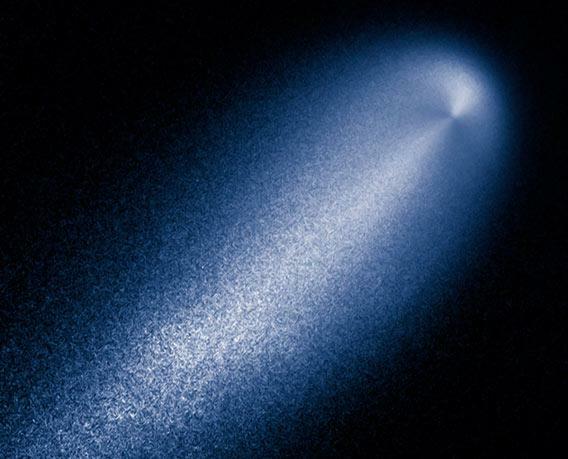 Comet ISON: Hubble picture taken to observe the comet’s activity. Hubble picture of the comet C/2012 S1 (ISON) while it was still nearly as far from the Sun as Jupiter. Click to enhalleynate. That’s a false color image; the blue was added to show details better. This picture was taken to get a measure of the activity of the comet as well as determine the size of the solid nucleus. What you see here is dust and gas surrounding the iceball in the center, which is most likely only five to six kilometers (3 – 4 miles) in size; small for a comet to be this active this far out. On the scale of the picture, it’s far smaller than a single pixel! Contrast-enhanced version showing more detail, including a jet of dust blowing out from the comet’s nucleus. The tail is pointing away from the Sun at the current time, and you can see a fan-shaped structure at the comet’s tip, toward the Sun. That’s a jet of material, caused by ice on the comet sublimating, turning directly into a gas. When that happens, dust lodged in the ice is freed, creating features like this. When this shot was taken, ISON was about 620 million kilometers (386 million miles) from the Sun, nearly as distant as Jupiter. Water is frozen solid at that distance, so the ice that sublimated here to create this jet was probably from carbon dioxide or carbon monoxide. The ratio of those two gases to water in a comet can reveal where the comet formed in the solar system (the ratio depends on the temperature of the environment where the comet formed), so astronomers will be using Hubble to observe ISON again soon to look for the fingerprints of those gases. Comet ISON may become very bright this winter. It’s on a path that will take it plunging down just over a million kilometers (700,000 miles) from the Sun’s surface. As it gets close to the Sun it will get very bright, and may become visible on Earth even during the day! We’ll see. We’ll also have to see what the fate of this poor dirty snowball is. It may survive the hellish trip, coming out the other side singed and smaller. Some comets disintegrate near the Sun, as you might expect. But a chunk of ice several kilometers across is big enough that even the Sun’s tremendous heat won’t necessarily vaporize in the short time it’s close by; Comet Lovejoy got far closer to the Sun and survived. We’ll just have to find out this winter. 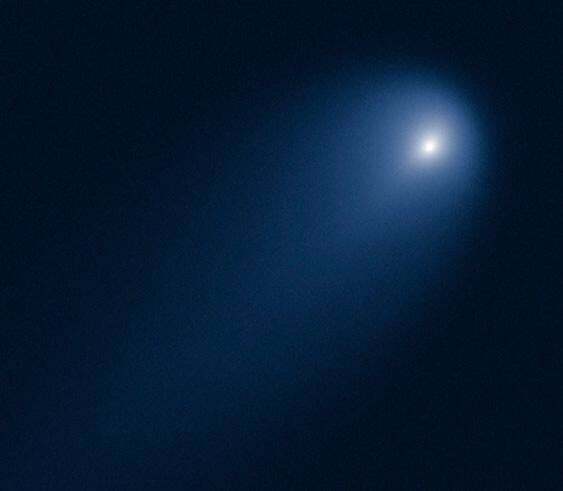 Comets are notoriously fickle, so all I’ll say is that ISON might—might—be amazing. I think no matter what it’ll be a great object to see, but whether it gets bright enough to see naked eye is still (haha!) up in the air.